The dynamic Automotive Focus Group (AFG) opened the 2012 year with an informative address by Charn Saralertsophon, director general of the Federation of Thai Industries (FTI) and a former special adviser to the Deputy Prime Minister and Minister of Commerce. Charn gave the members an update on the Thailand Auto Industry today, after the tsunami/earthquake in Japan, the floods in Thailand and the current Eurozone crisis. Going along with the current AFG practice of rotating venues, the January meeting was held at the Nova Platinum hotel, with the formal part of the proceedings followed by networking around the pool. As opposed to the chambers of commerce which cover many interest groups, the members of the AFG are part of the auto industry in Thailand. This makes the networking of enhanced value, with everyone understanding the industry where the others are coming from! Fifty members attended this first meeting of the year. 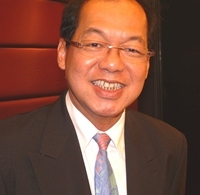 Charn Saralertsophon, director general of the Federation of Thai Industries. Charn Saralertsophon began by stressing that the Thai auto industry has always been resilient, and it should not be forgotten that Thailand’s auto production exceeds that of Italy, Indonesia and Malaysia. He also stated that the big name world manufacturers were not just looking at Thai production figures, but also had bases here because of the top quality workmanship. It was of interest that 11 percent of Thailand’s exports go to Central and South America, because the marketplace there has more faith in Thailand produced vehicles than from elsewhere. He produced many informative graphs showing, for example, that the one million vehicle milestone was passed in 2006, and until the flood situation, Thailand’s production was well on the way to two million in 2011. The car production figures expected were in excess of 1.8 million, but the natural disasters, and financial disasters, meant that the figure for January to October was 1.4 million. Still not a bad figure. The Auto industry provides 10 percent of the nation’s GDP, and there are 690 Tier 1 companies in Thailand. Charn spoke on the eco-car production, and although there are currently only two manufacturers of eco-cars, there are another three manufacturers coming. The production of these alone would very quickly push the annual production total past the two million mark. Contrary to what people had thought, the Thai government had already instituted an eight point plan to assist local factories that had been inundated. Many of these were excellent stimuli for the industry, but the news had not been well promulgated. This factor produced some spirited questions at the end of the session, along with further details on the B. 300 minimum salary. He finished with a slide showing the supportive factors that attracted investment in the Thai auto industry, including the fact that Thailand can be the gateway to 650 million people in ASEAN, and a springboard to China and India. It had been a wonderfully informative session for the AFG members, but in addition Uli Kaiser spoke on his new Thailand Auto Industry Handbook for 2012, which is an invaluable resource for anyone doing business in the auto sector. Next articleCardiac unit diet – fast weight loss?